At noon today I pulled up into the drive-thru of one of my favorite lunch locations. I ordered something a little different because I noticed that according to the sign that it would be on special. I rolled forward and pulled out my wallet to pay. My stomach sank as I saw that I had left my debit card at home. I counted the cash that I had in my wallet I knew it wasn’t going to be enough. As much as I appreciated her generosity she could tell that I was clearly distracted as I apologetically muttered that I had a problem. I explained my forgetfulness and that I was over a dollar short on cash. We attempted to modify the order (which she had already done for me) so that I would have enough to pay. After a futile attempt to change the order she came back and said that it was okay. Dropping items from the order wouldn’t make anything cheaper and she stated that she would just give me the full order for the amount of cash I had on me. I had scrambled around my loose change in the car and managed to present a payment that was still a dollar short. 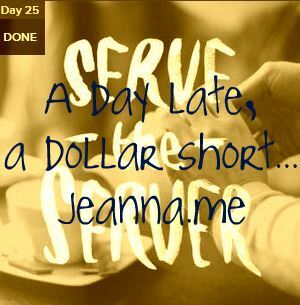 As she pleasantly took my money and encouraged me to have a good day I couldn’t help but think about the “Serve the Server” challenge from 40acts yesterday. I’m literally a day late and a dollar short in meeting this challenge…despite my failure to bring an act of generosity to the table, I was served a morsel of grace that left me peering into the face of Christ at the drive-thru window. The manager served by taking what I had and identifying it as enough. I chewed on that a little while and it tasted good to me. As disciples we extend grace. We serve one another. We look for the best in one another. Among many other things, we bridge the gaps in our weaknesses, identify strengths, pray for one another, and love one another. And we serve because He served. Jesus was not shy about serving the server. Jesus left fantastic tips all through the gospels. As shown in John 13:1-17 we are to serve one another. We serve, beyond mere hygienic necessity, beyond our own comfortable convenience, right into humble service with our Lord. It is so beautiful when people show up for work with Jesus inside of them. It is so beautiful when Jesus works inside of people, changing hearts and lives. And it is so very beautiful when you use your talents and gifts for His glory. Look up and see how God provides through you. Thank you for showing up and serving. It is my pleasure to build alongside you, my friends. Oh…and hug someone today. That’s today’s #40acts challenge.